Professor Antonio Contreras of DLSU took his official Facebook account to criticized the news article by ABS-CBN News writer Pia Gutierrez on the issue of the submitted Statement of Contributions and Expenditure (SOCE) of the Liberal Party. 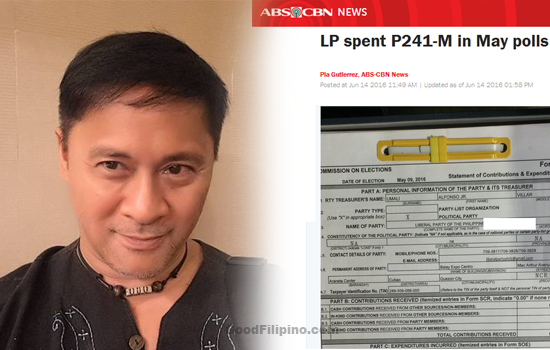 DLSU professor was referring to the article wrote by Pia and posted on News.ABS-CBN.com titled, "LP spent P241-M in May polls." "According to Republic Act 7166 and Section 5 of Comelec Resolution 9991, winning candidates elected to any public office nominated by parties shall not enter upon the duties of their office until the party has filed its own Statements of Contributions and Expenditures." Prof. Contreras said, "WRONG" then he added, "There is no statement in RA 7166 to this effect." "No person elected to any public offices shall enter upon the duties of his office until he has filed the statement of contributions and expenditures herein required,"
DLSU professor boldly said, "SO WHAT ABS-CBN REFERRED TO IS THAT WHICH APPLIES TO INDIVIDUAL CANDIDATES BUT NOT TO POLITICAL PARTIES." He even called the attention of the reporter and said, "Pia Gutierrez please correct this news item. It is inaccurate." Do you agree with Prof. Contreras explanation about RA 7166? Please share your thoughts below. Comments or suggestions about "DLSU prof criticized 'wrong reporting' by ABS-CBN News writer" is important to us, you may share it by using the comment box below.